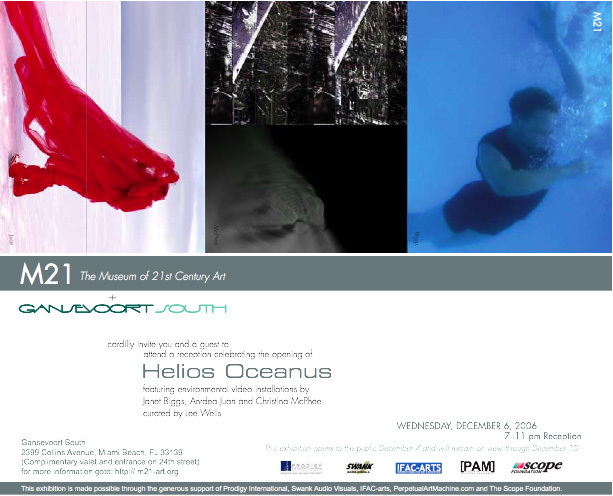 M21--The Museum of 21st Century Art and The Scope Foundation proudly inaugurate their first exhibition, Helios Oceanus. Featuring award-winning multi-channel video artworks of Janet Biggs, Andrea Juan, and Christina McPhee at the Gansevoort South, located at 2399 Collins Avenue, Miami Beach. There will be complimentary valet and entrance on 24th street. The reception will take place on Wednesday, December 6, 2006, 7 pm – 11 pm and will be open through December 10th. Curator Lee Wells will feature environmental video installations, which are explorations of the aesthetics of the sublime. Through both self-analysis and scientific investigation, these artists try to understand the ever-changing physical as well as psychological terrain. Metaphorical, psychological or physical association with the natural world not only gives insight to its secrets, but a certain familiarity negates feelings of estrangement and disconnect with such independent cycles as the tides and the rising sun. For example, Biggs pairs an underwater dancer with a galloping thoroughbred on a treadmill, drawing immediate parallels between the relationship of power and control between man and animal. Scientific veracity of such connections is tangential—emotional and visual correlations underscore inherent metaphysical congruencies. The other two videos emphasize the intrinsic and fundamental connection between humans and nature: Juan’s video documents the consequences of climate changes in Antarctica while McPhee's video meditates on a small California beach community overcoming the emotional trauma of a devastating mudslide. Helios Oceanus comments upon the socio-environmental condition of man on Earth in the 21st century. In the ever-changing landscape and the uncontrollable consequences of nature’s raw power, our actions or lack thereof will have a lasting impact on the world around us.